How Risky Is Disney's Stock? Disney's stock price has declined 24% over the last 13 months, which arguably makes it less risky than it was a year ago. The last 13 months haven't been kind to investors in Walt Disney (NYSE:DIS). The stock's total return (which includes dividends) of about negative 23% since hitting an all-time high in early Aug. 2015 significantly lags the S&P 500's nearly 5% return over this period. The stock's struggles are due to concerns about cable "cord cutting," as will be discussed below. This begs the question: Just how risky is Disney's stock? Primary risk: Changing consumer media market. Disney's primary external risk -- risks largely outside of its control -- stems from the changing way people are consuming TV and other media. The availability of subscription video streaming services has led to consumers increasingly dropping or slimming their large cable packages, resulting in a steady decline over the last few years in the number of subscribers to the company's cable channels. This decline is most concerning with respect to ESPN because the dominant sports cable network is a cash cow. This risk is considerable because Disney's media networks segment is its largest and most profitable business unit. For the first nine months of fiscal 2016, it accounted for about 42% of total revenue and 48% of segment operating income. Positively, the risk level has slowly been coming down because strong growth in the company's other segments means that the slower-growing media networks' relative size as a percentage of the whole is declining. Disney is aggressively pursuing opportunities that will allow it to thrive in a changing market. It's been successful getting ESPN included in various distributors' over-the-top "skinny bundles." Its boldest move came in August when it bought a 33% stake in BAMTech, a leading video streaming provider, for $1 billion. This stake will allow Disney to deliver its content directly to consumers and to profit as streaming becomes even more popular. Disney arguably has the most valuable media intellectual property in the world and it's setting itself up to be able to offer this content directly to consumers. With that in mind, investors need to ask themselves if they believe Disney will be successful in its efforts to thrive in the new TV-viewing world. Of course, like all companies, Disney has many external risks. The second most notable one which investors should monitor is the potential for the Zika virus to become more widespread in Florida and keep tourists away from Disney World. Primary risk: CEO successor risk. Internal risks include things within a company's control, such as setting a solid strategy, executing on that strategy, and successfully innovating. All these things require having the right top management team in place. The primary internal risk is a CEO successor risk. Bob Iger, who will be a hard act to follow, is set to retire as chairman and CEO at the end of June 2018, and there is no clear successor. This issue came into glaring light last April, after COO Tom Scaggs' surprise resignation. While never officially designated as heir apparent, Scaggs was widely believed to be in line for the top spot. Iger's already postponed his retirement twice at the request of the board, so whether he might postpone it again in order to spend more time grooming a successor once one is identified is anyone's guess. Disney, like all public companies, has financial risks related to its business and to its stock. Its business financial risk -- the risk of a company not having enough resources to grow or even maintain its business -- is low and controlled. Disney has a solid balance sheet. A company's stock-related risk stems largely from its valuation. This risk has come down over the last year due to the combination of the company's strong financial performance and its declining stock price. Valuation metrics based on earnings and cash flow have become more attractive over the year. 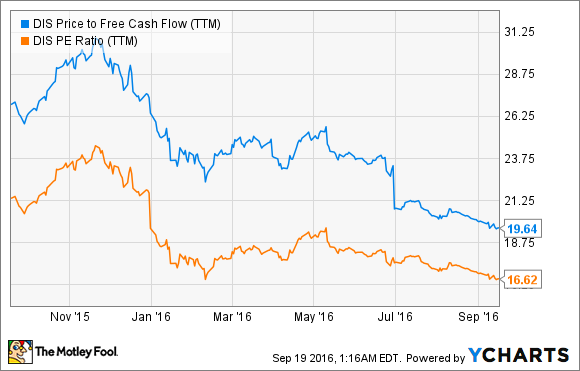 Here's a look at the price-to-earnings (PE) and price-to-free-cash flow ratios for the trailing-12-month period. PEG (PE/growth) ratios are more valuable in my view than the more commonly used ratios in the above chart because they take growth into account -- trailing growth for trailing PEGs and projected growth for forward PEGs. A stock sporting a PEG of about 1.0 is generally considered to be fairly valued, but higher-quality stocks and dividend payers will often sport premium valuations. So, Disney -- which pays a dividend currently yielding 1.5% -- can be considered to be somewhat attractively priced. It's certainly not dirt cheap -- but the chances of Disney or another such quality stock ever being dirt cheap are slim, in my view. 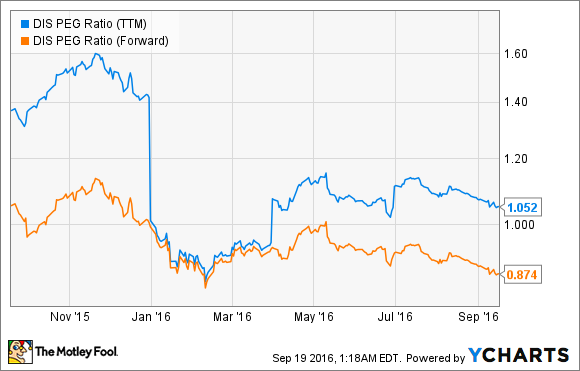 In short, much of Disney's stock-price risk has been wrung out over the last year. So the stock looks somewhat attractively priced if one is a long-term investor who believes that the company will be able to successfully navigate the changing consumer media market and that Iger's successor will be able to keep the show running successfully along.